When you see a casualty in a tank, do not rush and enter the tank to save him. Instead sound the alarm and muster the emergency team. Memories of this important lesson to cadets like me during a basic course in the 90s are still afresh. And we were told that enclose space is the talk of the town. Irony is that 18 years later, concerns about enclosed space casualties is still the talk of the town. 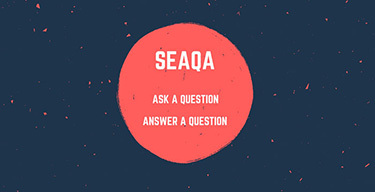 As per IMO, on average two seafarers in a month still die because of enclosed space incidents. There are extreme efficient procedures in place but enclosed space incidents did not decrease in last 2 decades. There can be many contributory factors for that. 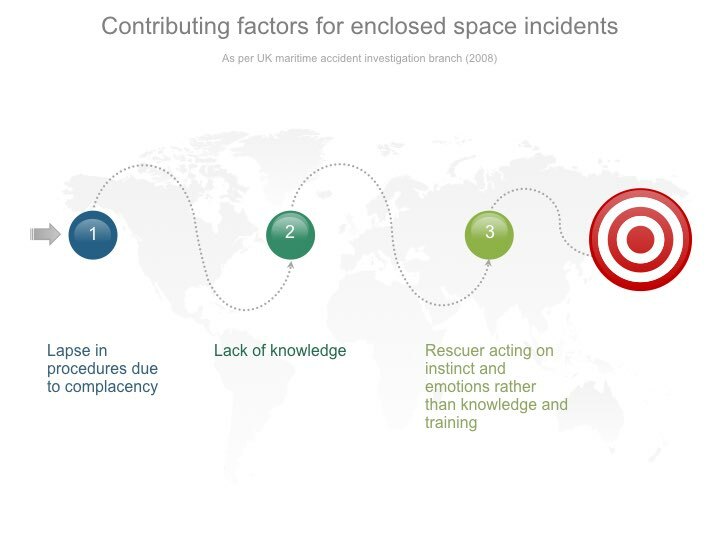 We may go overboard in addressing the problem but the fact remains that there are four elements that we need to address for safe enclosed space entry. Before we proceed to discuss these, we need to know what exactly is an enclosed space ? Before we discuss anything about enclosed space, we must define “enclosed space”. Is a deck store on midship of the ship an enclosed space ? No, I never heard someone filling up permit for entering inside a deck store. Then how do we decide what is an enclose space ? Difficult to access: A space can have a danger of exposure to lack of oxygen or presence of other deadly gases. In case of this exposure, climbing up aggravate the situation. While climbing a person would need more oxygen which in this case will not be enough. Also with climbing as the breathing becomes more rapid, the intake of other deadly gases will increase. This makes the spaces with difficult access more dangerous. Except the common work place of crew, any other space that require climbing will be an example of such space. Pump rooms are for example one of such space. Poor or No fixed ventilation: Poor or no fixed ventilation of a space means that there are high chances of absence of oxygen in the space. Apart from oxygen, there could also be high chances of presence of other deadly gases like H2S. Ballast tanks, cargo tanks and void spaces with no fixed ventilation system are few of the examples that fall in this category. Limited space: If there is limited space in a compartment, the rescue from these compartments could be very difficult. It may be difficult to remove the casualty to a safer place. Chain lockers, engine scavenge space are few of the examples that fall under this category. Not designed for continuous occupancy: The conditions inside these spaces could have changed drastically since it was visited last time. Now that we know what an enclosed space is, let us discuss the elements of safer enclosed space entry. 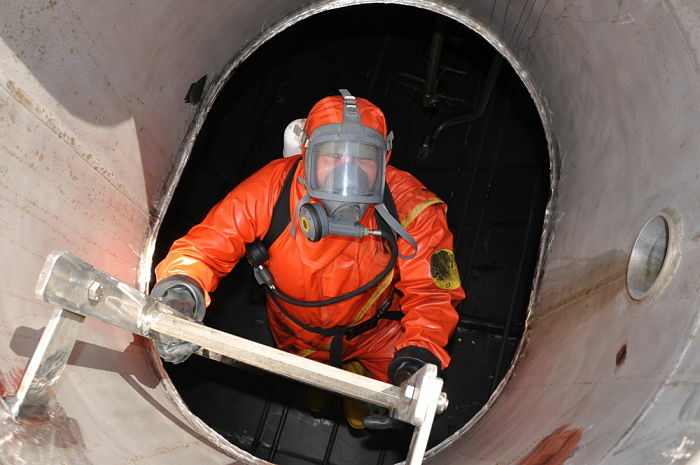 To ensure the atmosphere is safe we need to know what are the dangers we can expect inside the enclosed space and how we can mitigate these dangers. Apart from slip, trip and fall, the main danger with enclosed spaces is the lack of oxygen. Want to know how dangerous the lack of oxygen can be ? A person can survive 3 weeks without food, 3 days without water and 10-45 minutes in ice cold water. 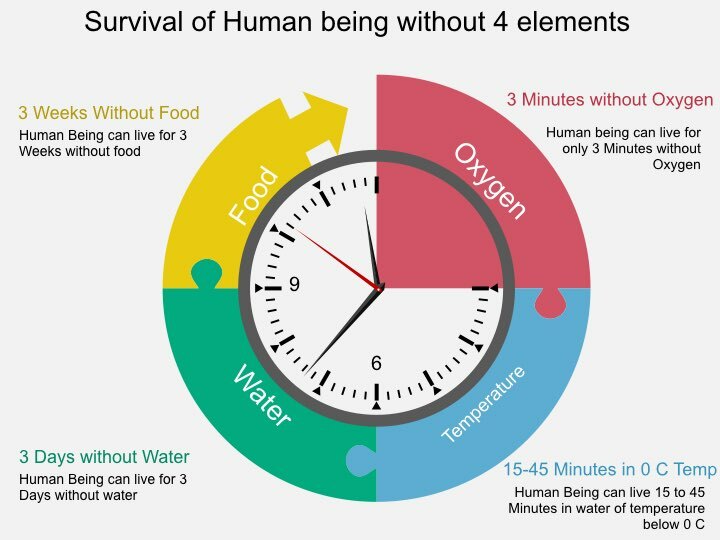 But a person can only survive for 3 minutes without oxygen. Yes, it is that serious. 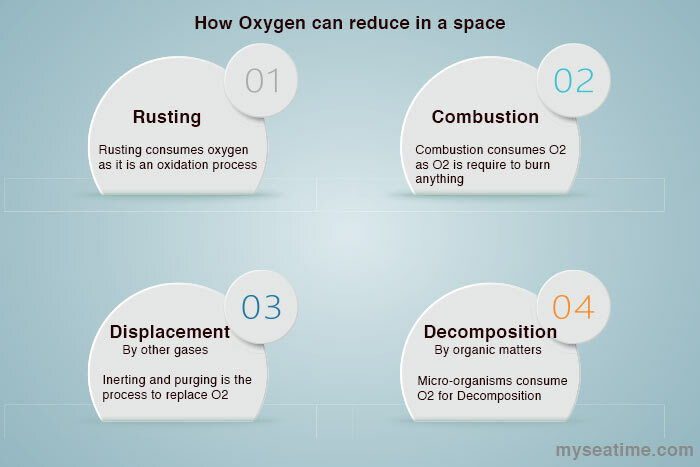 But how can oxygen in a space be reduced ? Where does this oxygen go. Well there are many ways oxygen can be consumed in a compartment. The most common among these is the the rusting of the metal. The process of rusting is an oxidation process that consumes oxygen. Even if there is sufficient oxygen in a compartment does not mean that it is safe for entry. The presence of toxic vapors in a space can be deadly too. 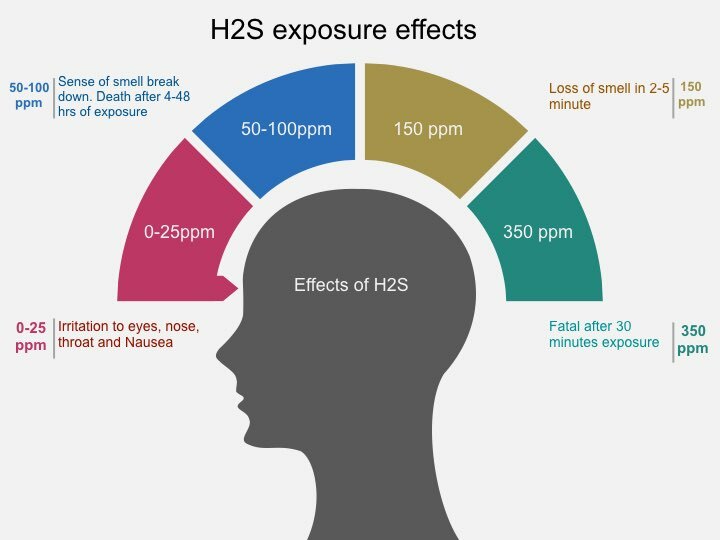 For example exposure to H2S can cause immediate loss of consciousness and death. Apart from H2S, gases like Benzene could also be present on all tankers. On chemical tankers that load different kind of chemical can have different type of toxic gases around them. If you thought a person cannot be trapped inside an enclosed space, let me let you a real story. Two cadets went into the ballast tank to clear the choked sounding pipe just before departure of ship. A ship’s crew saw the ballast tank access cover open and closed it and secured it. The chief officer ballasted the tank to reduce the trim. Two cadets died of drowning. On departure when crew were searching for the cadets, they realised cadets might have been in the ballast tank. The bodies were recovered. This was in the year 1998 but things have not changed. 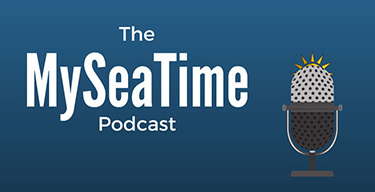 In 2005, crew died because they were trapped in the ballast tank of a cruise ship. In short there have been many casualties because of being trapped inside an enclosed space. This poses another hazard in the enclosed spaces. As per UK P&I, one in every third personal injury claim results from slip, trips and falls. This is not uncommon in personal injuries cases in enclosed spaces too. People can slip because of muddy surface in the ballast tanks. People can trip because of so many pipelines and obstruction in an enclosed space. And people can fall while climbing up or down an enclosed space. 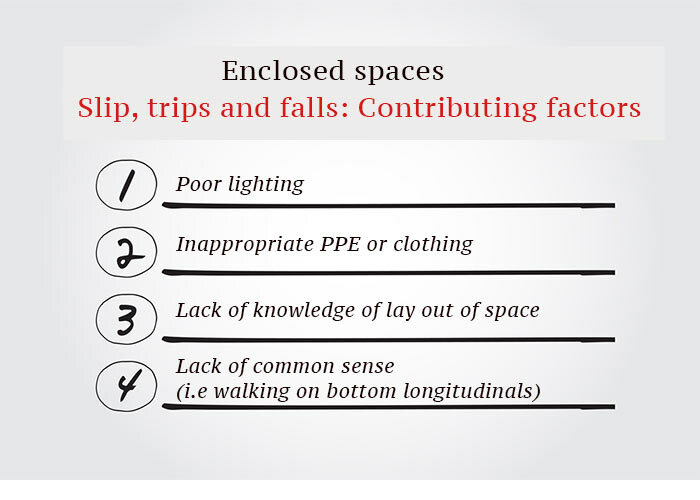 Most of the enclosed space will have all the elements that have the dangers of slip trip and fall. Now that we have identified the dangers associated with enclosed space. Let us see how each of these dangers need to be dealt with. I have stressed so far about the presence of toxic gases and the absence of oxygen in a space. This can be reversed by ventilation. But it is important that ventilation of the space is effective. 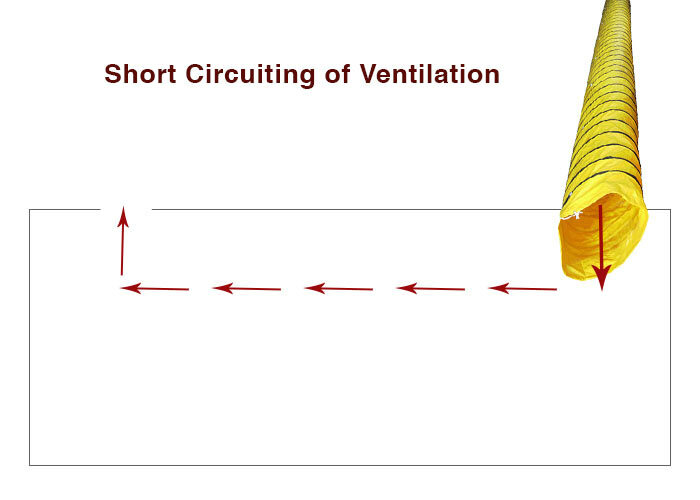 For the ventilation to be effective, the ventilation equipment should be placed adequetly in a way that short circuiting of the air do not take place. We identified lack of oxygen and presence of toxic gases as the main factors for enclosed space casualties. To avoid these casualties, we need to ensure that atmosphere inside the enclosed space is ideal for man entry. We can only achieve this by measuring the atmosphere. For example if the oxygen inside the enclosed space is less than 20.9%, we would not make an entry into this space. 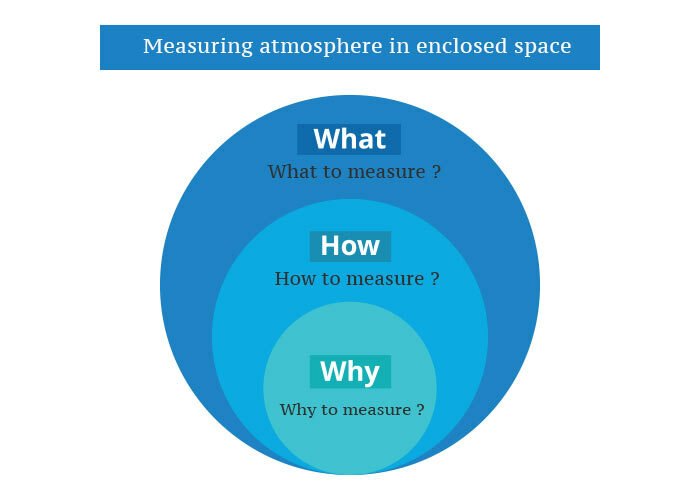 But how can we ensure that if we do not know what when and how of measuring the atmosphere ? We need to know the answers to questions like what to measure, when to measure and how to measure the atmosphere. Apart from oxygen we also need to measure presence of toxic gases inside the enclosed space. Knowing what to measure important. For example will you measure anything apart from oxygen in a space containing wooden pallet cargo ? If we do not know that there are high chances of presence of carbon mono oxide in a space containing wooden pallets, how can we measure it ? Crew members have died of Carbon mono-oxide exposure by entering cargo holds containing wooden pallets. So first thing to know is what all toxic gases we can expect in an enclosed space. For example on tankers, H2S, CO, Hydrocarbons and Benzene are the most common toxic gases. Knowing the properties of the cargo on board and all other materials in and around the enclosed space will tell us what to measure. Moreover company’s SMS manuals need to address the toxic gases ship staff can expect on the ship. The second important thing to know is how to measure these gases. For example will you measure the gases at the top level, middle level or bottom level of the enclosed space ? If you measure H2S at the top level, you will most likely get zero or incorrect reading. This is because H2S is heavier than air and will always settle at the bottom of the space. If you measure Carbon mono-oxide at the bottom of the space you will get zero or incorrect reading. Again this is beacuse CO is of same weight as air and may settle in middle of the space. Now instead of knowing the weights of each gas and then deciding where to measure, it is a good practice to check the concentration of a gas at multiple levels. The concentration of a toxic gas below which it is safe for exposure of the a human being is called “Threshhold limit value“. By measuring we can decide if it is safe to enter the space or not. If the measured concentration is lesser than the TLV value of that gas, it would be safer to enter. Will a compartment that was safe to enter 20 hours back be safe now too ? Off course the answer will be No. Apart from that we should check the atmosphere after a pre-determined time (say after every 2 hours). The repetitive checks can be done by a responsible person outside the space. 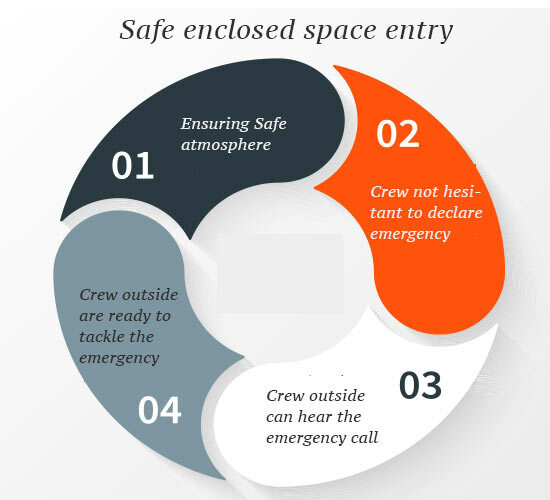 But revised IMO guidelines require that each person entering the space should check the atmosphere themselves. How can we ensure that someone does not close the opening of the enclosed space while a person is still inside ? Off course the best way is having a link man stationed at the entrance all the time. But we cannot rely only on this one control. Apart from the link man, the use of entry tags is considered to be the best way to mitigate this risk. For example look at this tag. This one tag is attached at the entrance of the space for each person that enters that space. 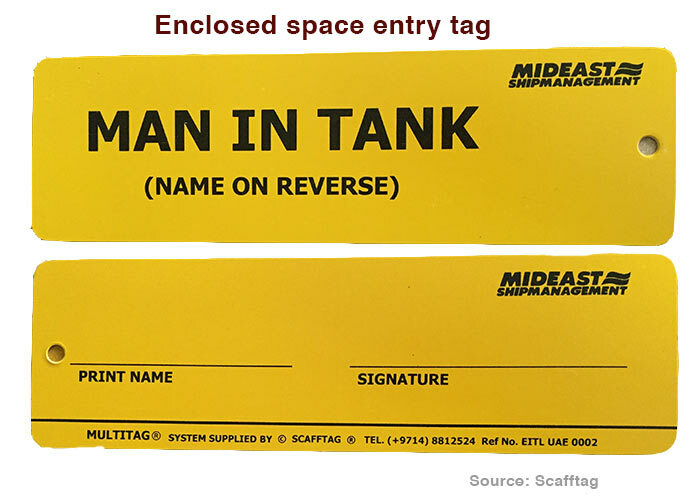 When a person is out, his tag will be removed from the entrance of the space. The number of tags shows how many people are inside the space. Now any person willing to secure the space can check from the tags if any person is inside the space or not. Inside an enclosed space, there can be various reasons for the slips, trips and falls. For example, a person may not be able to avoid hitting with ship structure because of poor lighting. Or crew may slip because they are not wearing anti-skid safety shoes. Ship staff must ensure that these contributing factors are eliminated to avoid dangers of slip, trips and falls. Different people can have different reaction to atmospheric conditions. Some people can work comfortably in an atmosphere with oxygen level of around 20% while other may not. When a group of crew are working in an enclosed space, when one feels uncomfortable, he may not declare that he has an emergency. The reason could be confirmation bias where in the person thinks that everything is OK because other person has not complained. The other reason for not declaring the emergency is the tendency of the crew to finish the job before they exit the enclosed space. This is specially the case when the job would take just another couple of minutes to finish. It is important that the crew entering the space are appraised of the importance of even couple of seconds that can save the life. Crew should be willing to leave the work and declare emergency in case they do not feel comfortable. When an emergency is raised by the crew inside a compartment, crew outside the space should be able to respond to that immediately. This require the link man to be stand by near the entrance of the space. They also need to check that communication link is not broken at a specified interval. Sometimes it may not be possible to communicate from the entrance of the space. In this case employing two link men, (one outside the entrance and other inside) may be necessary. I earlier said that a person can die within 3 minutes without oxygen. That shows that in an emergency, the rescue party or people outside have less than 3 minutes to bring the person out. In this situation, if the rescue and first aid equipments are not ready at the entrance of the space, it is impossible to save the person inside. The presence of these equipment is not enough. People outside should also know how to use these. For example, when a person who has been unconscious because of lack of oxygen in his body would need oxygen immediately. 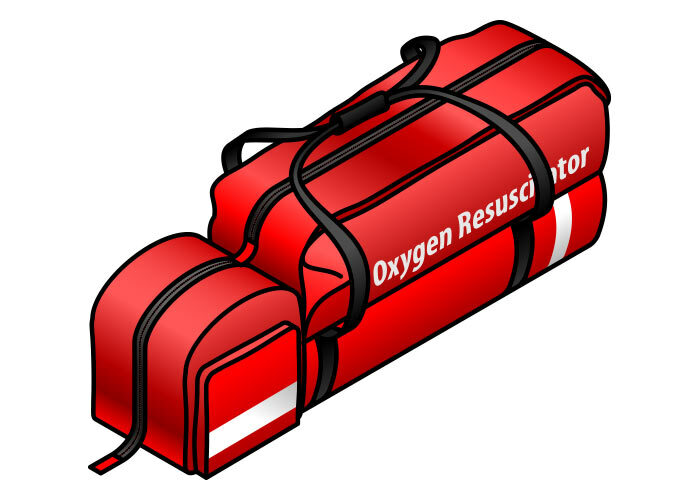 The crew outside should know how to use the portable resuscitator. This will save the time in reading instructions. I am also a big advocate of carrying EEBD inside the enclosed space while making entry. If a person feels uncomfortable, he can have the option to wear EEBD and come out. This can be life saving in some situations. While I have covered most of the things and I may have missed few. But even if I have not missed, is it possible to remember all these points ? Just following the guidelines and enclosed space entry checklist can ensure that all these point are covered. Incident on board Sally Ann C is the latest example of enclosed space casualties. The chief office entered the cargo tanks without any checks and without any person standing by outside the space. Chief engineer and then 2nd officer followed to rescue him and they too collapsed. While chief officer and chief engineer died, 2nd officer sustained serious injuries. It is foolish to believe that these three officers did not know anything about the enclosed space procedures. It is also foolish to believe that they were not aware of the dangers associated. They were as competent as me and you, may be even more. The problem was same as identified by IMO as one of the serious problem in shipping right now. 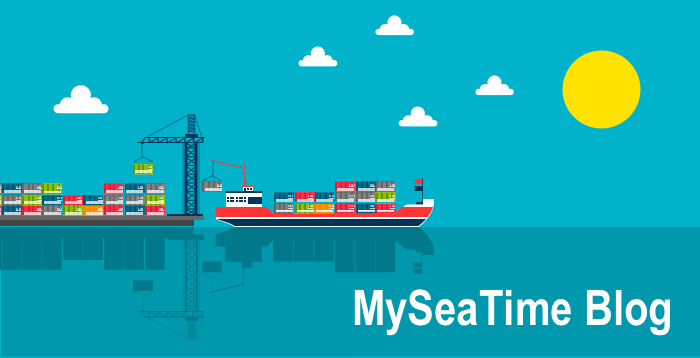 IMO believes that there are enough regulations in shipping but what is lacking is the compliance with these regulation. A company need to put in their efforts to ensure compliance. Compliance is only possible by having a safety culture that can be measured and improved over time. Enclosed space casualties continue to be alarming. In spite of efforts by the industry experts to streamline the procedures, there has hardly been any decrease in these incidents. Knowing the risks involved and reminding ourself about these risks again and again can be of some help. Company need to develop a safety culture strategy to ensure increasing compliance with the procedures. A Company can also make the procedure simpler to ensure that these are easy to follow and people are willing to follow these procedures.